Your house will smell wonderful while this is cooking and the flavor is amazing. In a small bowl, stir together the brown sugar, thyme, salt, black pepper, cinnamon, nutmeg, ginger and cayenne. Arrange the sweet potato slices in the bottom of the slow cooker. Add the chopped onion and sprinkle everything with about half of the sugar and spice mixture. Coat the pork tenderloins with the remaining spice mixture and place them in the slow cooker on top of the vegetables. Depending on the shape of your cooker, you’ll probably have to curl the tenderloins around a bit to make them fit — that’s fine. Top the tenderloins with the chopped apples and the cranberries, then add the water and cover the cooker. To serve, remove the tenderloins to a cutting board and carve crosswise into thick slices. 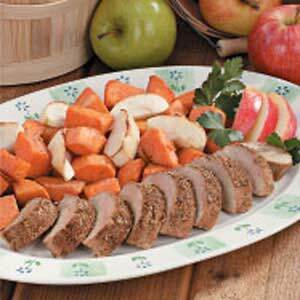 Spoon the sweet potato-onion-apple mixture into a serving bowl and arrange the pork slices around the edge. If there’s any liquid left in the slow cooker, serve separately on the side.